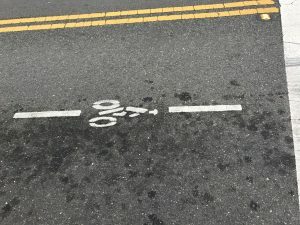 I had a ray of hope when I noticed the stenciled bike rider icon and some lines, located in the middle of the traffic lane. It seemed to promise that I could position my bike over the lines, and it would trigger the sensor to change the traffic light without the dismount-walk-press-return ritual. The promise was not fulfilled. I have now, collectively, waited an hour or more on top of those little icons and never had a light change unless a car or pedestrian triggered it. I can also tell you that, even though they’re approaching a red light and I am already moving out of the way (knowing the automobile will trigger the sensor), drivers sometimes become homicidal at the sight of a bicycle in the middle of a traffic lane. Perhaps there isn’t enough steel in my bike to trigger the sensor. More likely, the county got sold a bill of goods with the sensors, or they just stenciled the icons on the road to pretend to qualify for some grant intended to improve bicycle safety.